Kurdistan Republic of Mahabad (officially Kurdistan Republic, Kurdish: Komara Kurdistan), also called as People’s Republic of Mahabad, was one of four Kurdish nation states in the 20th century. It stood 11 months in today’s northwestern Iran. With the Republic of Ararat, there had already been a trial in northern Kurdistan 15 years earlier, but it failed. The Republic of Kurdistan was founded on January 22 , 1946 and overthrown by the Iranians on December 16, 1946. The epithets of the state, especially in Europe refer to its capital Mahabad. During the Second World War, the west of neutral Iran was occupied by the Soviet Union and Britain in 1941 (Anglo-Soviet invasion of Iran). This was to create supply routes to the Soviet Union. Also, the crew should have prevented Reza Shah Pahlavi from standing on the side of Axis powers. The Soviet Union wanted to exert influence in this region and explored Azerbaijanis and Kurds, with which the USSR could form an alliance. For example, the Kurds were asked to found a new party and finally declare an autonomous republic. The same did the Azerbaijanis. This event goes down as the Iran crisis in history and marks the beginning of the Cold War. On 15 December 1945, President Qazi Muhammad declared the People’s Republic of Kurdistan in Mahabad at the Chwar Chira (Four candles) Square. The founding of the People’s Republic of Kurdistan took place three days after the founding of the Autonomous Republic of Azerbaijan. The territory was an elongated strip of Iranian territory that stretched along the borders of Iraq and Turkey in the north to the Soviet Union. National anthem of the new state was Ey Reqîb. At about the same time, more than 3,000 Barzani tribesmen Southern Kurdistan came to Mahabad. They joined the Republic and formed their army. Their leader Molla Mustafa Barzani was appointed general. 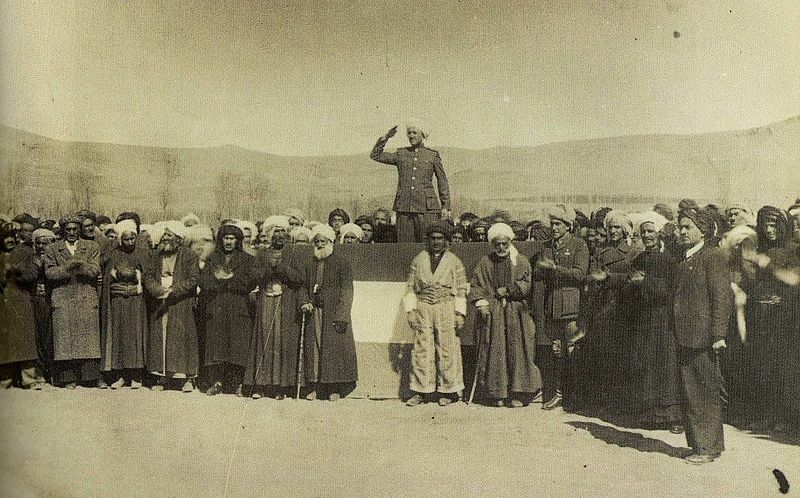 Qazi Muhammad declaring the Kurdistan Republic. Mustafa Barzani is on the front row in light colored clothes. The main tasks of the republic were the establishment and development of an educational system and the cultivation of the Kurdish language and culture. The Democratic Party of Kurdistan-Iran, chaired by Qazi Muhammad, constituted the government of the state. A parliament was formed with 13 deputies. Already in April and May there were several battles between the Kurds and the Iranian army. However, these were terminated for the time being by a truce. So it came to negotiations between the Iranian government and the Kurds with participation of Great Britain. The negotiations led to no result, so that Iranian troops finally attacked again the positions of the Barzanis. After the withdrawal of Soviet Army, the Republic of Kurdistan was dominated by Iran on 16 December 1946. The region is now part of the Iranian province of West Azerbaijan. The result of the war was destruction of Mahabad Republic and the elimination of its leadership. Because of “turmoil” and “high treason” President Qazi Muhammad was sentenced to death. At dawn on March 30, 1947, the representatives were executed. The Kurdish culture was suppressed in the following years. The Barzanis fled to the USSR. To this day, the Republic of Kurdistan is seen and idealized in all parts of Kurdistan as a model of Kurdish self-government. However, according to Archibald Roosevelt (son of US President Theodore Roosevelt), the republic failed because the Kurds were dependent on the protection of the USSR . They lacked the necessary material to assert themselves, even if there were plans to provide the necessary military supplies to the Kurds. But it was precisely, that these close links with the USSR created a large opposition within the tribes against the republic. This aversion and anxiety caused some Kurdish tribes to join the Iranian army. The flag of the republic consisted – from bottom to top – of the colors green, white and red. In the middle was an emblem, a quill that stood for culture and science, between two wheat ears that stood for production and work, and in the background, the sun as a symbol of freedom. The flag of Mahabad is similar to the official flag of the Kurdistan Autonomous Region (Kurdish: Başûrê Kurdistanê). One legend about the flag of the republic is that Qazi Muhammad gave it to Mustafa Barzani before his death. He asked Barzani to continue to fight for the flag, and Barzani took it on his “long march” to the USSR. The flag is still owned by the Barzani family.